BT is re-entering the UK's consumer mobile phone market, with a range of 4G subscriptions. Its cheapest offer is aggressively priced at a discounted rate of £5 a month for existing BT broadband customers. The service will use spectrum provided via a partnership with EE - a network BT is attempting to buy outright - and spectrum that BT owns itself. One analyst said bundled access to football games would help the company. BT is offering customers who sign up to its BT Mobile contracts the ability to watch Premier League football matches that it owns the rights to via an app, even if they are not broadband customers. "An entry tariff of £5 a month will grab headlines, but inclusive access to BT Sport and five million wi-fi hotspots offers important differentiation in a cut-throat field," commented Paolo Pescatore, from the telecoms consultancy CCS Insight. "We expect initial low-key marketing to heat up as BT makes a broader assault on the bundled telecom market over the summer." BT's basic deal - which includes 200 minutes of calls and 500MB of 4G data - will cost £10 a month to customers who do not have a BT broadband subscription. BT is the UK's biggest broadband provider with 7.6 million consumers signed up to the service, according to its latest figures. The mobile deals it has announced so far are all Sim-card-only, meaning that calls, data and texts are included but not a handset. BT has said it will provide more details of its strategy after its proposed £12.5bn takeover of EE - currently co-owned by Orange and Deutsche Telekom - is complete. 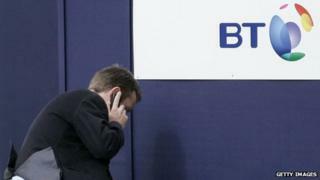 Regulators have still to sign off on the acquisition, which is opposed by some of BT's rivals. BT was one of the pioneers of the UK's mobile phone sector with its Cellnet service in the 1980s, but later spun off the business. The mobile phone firm, which was rebranded as O2, was later acquired by Spain's Telefonica. The UK's second biggest broadband provider, Sky, has also announced plans to offer a mobile phone service, allowing it to offer its own rival "quad-play" bundle - including internet, landline phone, TV and mobile - but has not scheduled the launch until 2016. Virgin Media and TalkTalk - the country's third and fourth biggest broadband firms, do offer packages including all four services. However, their mobile phone services are both limited to 3G data at this stage, meaning they are likely to provide slower mobile internet speeds than BT's 4G service. A spokesman for TalkTalk said it would begin offering 4G "later this year" through a deal with O2. At launch, BT Mobile will be totally dependant on EE's network. However, BT intends to make use of 2.6 GHz radio frequencies, which it bought as part of 2013's 4G auction, to let its customers boost reception inside buildings via special base stations called femtocells within the next 18 months. "BT is a credible player in the telecoms market and will be in a far stronger position next year with the inclusion of EE, subject to regulatory approval," said Mr Pescatore. "Rivals should be threatened by this move and Sky in particular will need to react given how punchy BT's SIM only deals are. "With this in mind Sky may need to launch mobile a lot sooner." Customers of smaller broadband providers are happier - Which?